My family and I just returned from a wonderful experience. My oldest son, Hayden, just graduated from his basic training in the United States Air Force. 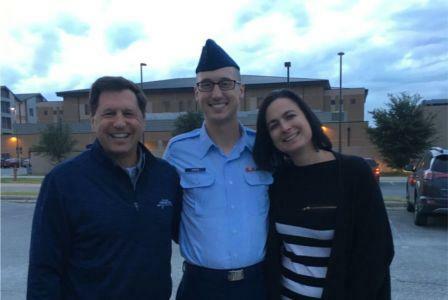 He is now known as Airman Hughes. My wife, Tanja, and me with the newly graduated Airman Hughes. I was told by a few others who had gone through the experience with a family member or a friend that the event is something special. It really was. All of the basic training for the Air Force takes place at the Lackland Airforce Base just outside of San Antonio, Texas. Prior to showing up, we were required to get a background check to enter the base. After the trip, I understand why. We were able to drive all around the base and get access to most things there. I am a plane nut, and if you add the word “military” to “plane,” I become double nutty. I just love them. They had sixteen C-5 transport planes and twelve F-15 fighter jets for training. We were able to go on the base right up to the runway fence and watch them take off. Even though all of this was super special for Hayden and us, it is somewhat routine for the Air Force. They graduated 721 Airmen in this class and they do that every week of the year. It was fun to be around all the young men and women who are full of energy and have a sparkle in their eye for a bigger and better future. It was also so refreshing to see all the respect given to one another. It is nice to hear people being referred to as sir and ma’am. We are very proud of Hayden. He heads off to Fort Lee, Virginia for technical training in air transportation. He will come home at the end of March for a few weeks, and will then be assigned to an Air Force base somewhere in the world. He is able to make a list of his top choices to be stationed at, and he listed Italy, Germany, and Japan as his top picks. He is really hoping for Italy, but it could end up being exotic Sacramento, California. No matter where he ends up, our whole family is extremely proud to have Airman Hughes be of service to this great country of ours.